As I was doing some research I came across some information that struck me as almost unbelievable. In fact, it’s something that may unlock so much potential for online business in the next 3-5 years that it’s hard to believe. Ok, granted, this is not so impressive. First of all the data is not so fresh, and also it’s the kind of map that everyone would expect. Deep penetration in North America, Europe and Australia, decent to good in Asia and South America and not so good in Africa. So far no surprises. This chart unveils a much more interesting reality. First of all the differences between the top and middle bar, which are obviously a function of the internet penetration that we examined earlier. Some languages are very much over-represented among internet users (e.g. English) while others are quite under-represented (e.g. Arabic, French). What is really surprising, though, is what happens in the bottom bar. 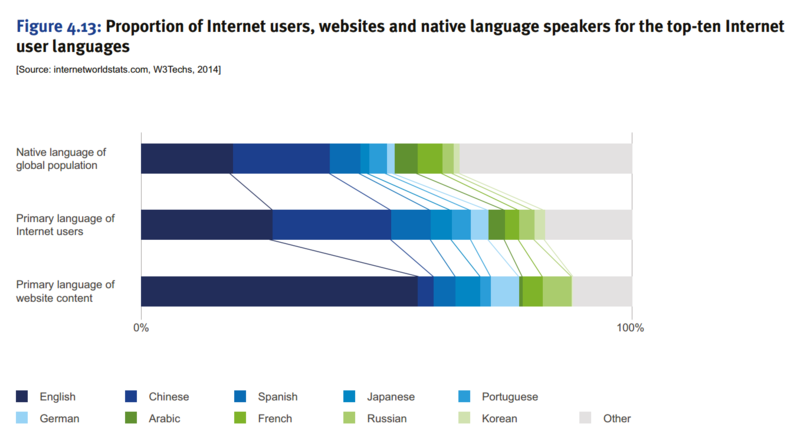 The bottom bar represents which languages are used as primary languages for websites and online content. Think for a moment about all the analytics, tracking, user profiling and intelligence that websites put in place. One would expect that smart publishers and webmasters would produce content that matches exactly the users’ demand for content. We already discussed how important it is to give users content in their native language so it’s reasonable to expect that languages online would be available proportionally to internet users. Well, nothing could be further from the truth. Boom. The needs of 21.7% of internet users (that’s more than 1 in 5!) are not met properly. This is huge already, and we are only talking about Chinese speakers. Sum up all the other under-represented languages on the internet and you come up with some very impressive numbers. From my point of view this means that businesses that will take website localization seriously will enjoy unbelievable potential for growth in the next 3-5 years, maybe more, until these gaps are reduced. It’s an entire blue ocean waiting for smart, multi-lingual small businesses to dive into. First come, first served. Bon voyage!